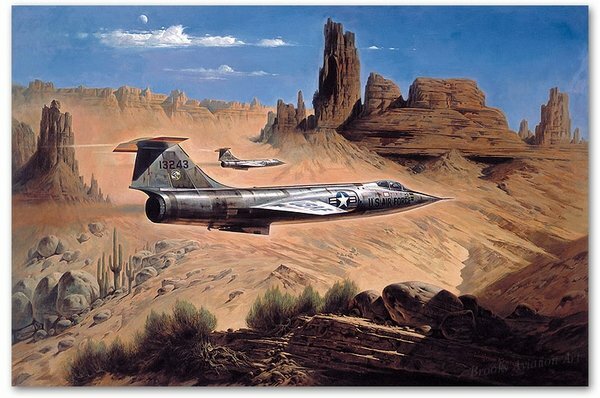 The Lockheed F-104 Starfighter, aptly called "the missile with the man in it" by the awe-struck aviation community of its day. Designed by the immortal Clarence Kelly Johnson and built by Lockheed at their mysterious Skunk Works facility in California, it was designed to be a hunter and fighter from the outset - the shape and form of a swift killer, a gunfighter of the modern day and age. Patrolling the skies over the Western United States, the very countryside that its 'predecessors' rode across on horseback, its task was to track down and intercept intruding high speed enemy aircraft.